Short on your vacation budget? 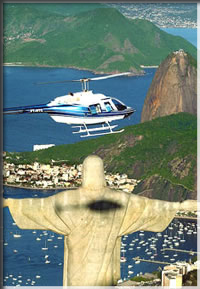 With this package, you will still be able to enjoy one of the most exciting cities in South America, Rio de Janeiro without sacrificing quality! Blessed with a wonderful natural setting wedged between mountains and the sea, watched from above by Christ the Redeemer atop Corcovado Mountain, and surrounded by tropical forests and lagoons, Rio de Janeiro has transformed into one of the world's most beautiful cities. A city of 8 million people, Rio offers world class hotels, restaurants, shopping, nightlife, beaches and various sporting activities. NOTE: PRICES ARE NOT GUARANTEED UNTIL FULLY PAID. Packages are LAND-ONLY, except otherwise indicated Prices are per person, based on double occupancy, subject to availability and change without notice. Blackout days may apply. Airfares may not be available on all flights and are subject to change without notice. Fares do not include (a) a federal excise tax of $3.70 per U.S. domestic flight segment, defined as one takeoff and landing, of a passenger's itinerary; (b) up to $18 per round trip in local airport charges; and (c) September 11th Security Fee of $2.50 per enplanement originating at a U.S. airport. For international/Puerto Rico/U.S. Virgin Islands destinations, government taxes and fees of up to $190 varying by destination, are not included. Weekend surcharge and /or last minute booking fees may apply. The final price for your tour package depends on day of departure, departure city, length of stay, hotel selected, room category and class of airfare available at time of booking. Hotel photos are representative only and do not necessarily depict the actual room in which guests will be accommodated. Travel Insurance: We highly recommend to all customers to protect their trip obtain Travel Insurance.